Well, Sushi Teri closed sometime in 2015. Let's see what's next for this location. 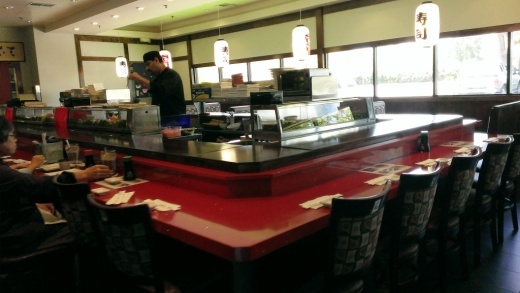 Final Update 5/13/13: Sushi Teri Teppan House in Camarillo opened its doors to the public today. It looks a lot brighter in here. While pretty much the same, I was a bit sad to see the humongous sushi conveyor belt completely removed. I thought that was so cool. Update 4/30/13: Sounds like Sushi Teri Camarillo will be opening sometime in the next few weeks according to the person that answered their phone at 805.389.5455. In the space previously occupied by Yamato at 1901 East Daily Drive in Camarillo there is a sign that says a new sushi bar is coming to town...Sushi Teri Teppan House. Great news! Yamato closed its doors last summer but left behind quite a nice, large rotating sushi bar (in fact, this easily the longest rotaing sushi conveyor belt i've seen in 30 years of sushi consumption) and teppan restaurant. More on Sushi Teri at sushiteri.com.